There are so many variations of this dish, and I've tried at least a dozen. But this version wins by far. I'm convinced that it is the finely ground nuts that makes it so wonderful. It's handy to have one of those mini food processors for a job like this. I love mine. Anyway, Crumbles originated in Britain, whereas Crisps are generally considered more American. There's not a whole lot of difference, but I think of Crisps as having oats in them, whereas a Crumble would not. Lots of debate on this topic, so Google it for yourself. You can use any type of apple in this, but I had a bunch of Honeycrisps that needed to get used, and it was insane. Really a nice fall treat. Preheat oven to 375F. Before melting your butter, use the stick to grease an ~8-9" square baking dish. In a medium bowl, combine the apples, sugar, 1 Tablespoon flour and 1/2 teaspoon cinnamon, toss to coat, place in baking dish. 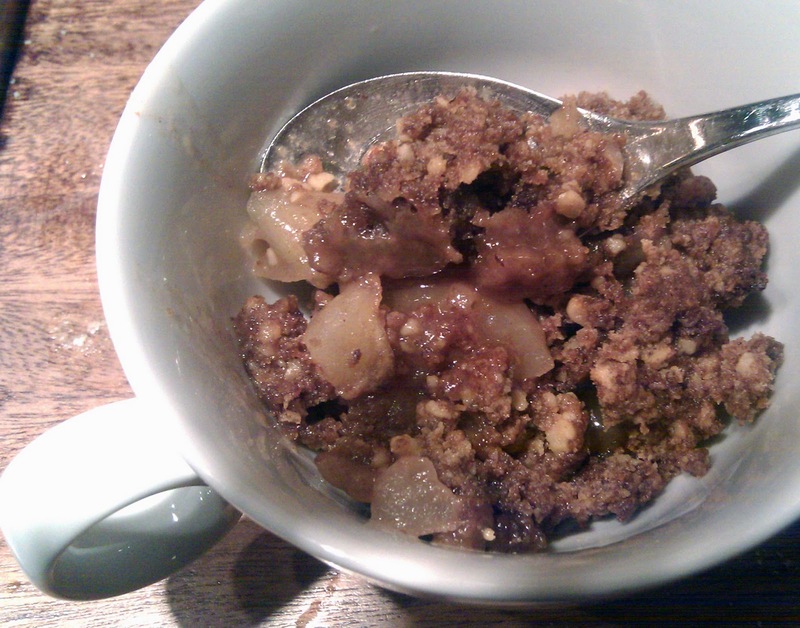 Using the same bowl, combine the remaining ingredients, then sprinkle over the apples. Bake 45-60 minutes, until apples are soft and top deep golden.